If you are driver looking for coverage, you will find the cheapest auto insurance companies in California with Nationwide, Century National, and Progressive. Each carrier is from 19% to 36% lower than the median rate for drivers of similar age and profile. If you are military or former military your best option is going to be with USAA. Other companies you want to put on your bucket list to get quotes are Grange, Allstate, and State Farm. All three carriers can offer quotes from 16% to 30% lower than the median quote for similar age drivers. Depending on the city you reside in, a good option is Allied, now owned by Nationwide. They offer competitive quotes throughout many regions of California. In this article, I am going to cover the least expensive car insurance companies by age and city, the minimum requirements to drive, and a few cost-saving tips to help you lower your monthly auto premium. Note: A 25-year-old driver in California can find cheap car insurance with Nationwide, Century National, and Progressive. Each queried at $1,833, $1,843, and $1,876 per year for full coverage. Which is at least 27% lower than the average premium of $2,565 in California. 1.3 Who has the Cheapest Car Insurance in California? The minimum liability requirements are 15/30/5. These numbers represent the minimum amounts in thousands of bodily injury and property damage liability each driver must maintain. The numbers, (15 & 30) represent the minimum bodily injury liability coverage for motorists. Bodily injury liability pays for the medial costs of passengers in the other automobile; $15,000 for a single person with up to $30,000 if there more than one individual is injured. Note: A 30-year-old driver in California can find the least expensive insurance quotes with Nationwide, Century National, and Progressive. Each queried at $1,612, $1,654, and $1,670 per year for full coverage. Which is approximately 28% lower than the average premium of $2,288. Property damage liability insurance pays for damage to buildings, traffic signs or the other party’s vehicle. The minimum amount in the state of California is $5,000 which is represented by number (5). Below are low-cost carriers for drivers from 25 to 55 years of age. I queried for quotes for 18 insurers to find the overall least expensive premiums based on an average per driver with no driving violations, good credit, and not married. In California, the top carriers pretty much offer the lowest premium. 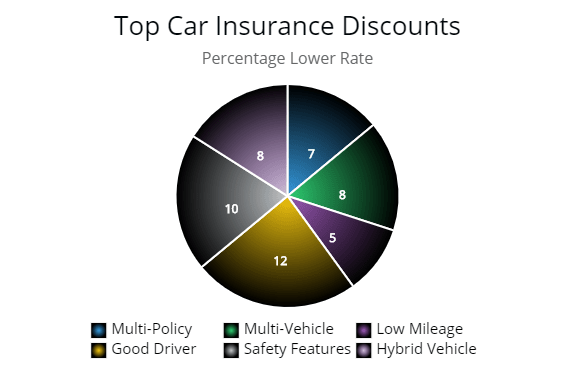 There is one local carrier, Century National, which offered the 2nd cheapest car insurance quotes for drivers. The three lowest are Nationwide, Century National, and Progressive. Each insurer can offer quotes from 19% to 36% lower than the median rate for drivers of a similar age and profile. Other carriers to put on your list to get quotes are Mercury, Grange, Allstate and State Farm. Each insurer can offer quotes from 16% to 30% lower than the median rate for similar profile drivers. Your best option is to get quotes from any of the carriers listed then compare quotes. You have to take into consideration discounts which may be offered too. Insurers may offer a discount while others may not. In the end, if you want to get the least expensive premium, your best option is to maintain a clean driving record. Although car insurance in the state of California is higher than average, there are discounts available in the state, such as good driver discounts, student driver, and driver safety discounts. In the state of California if you have driven for three years with no traffic violations you can get more than twenty percent off your insurance premium. If you are student residing in California you can get over twenty-five percent off your premium if you have good grades. If you have traffic violations or are over the age of fifty-five you can get thirty percent lower rates for taking a driver safety course. California has a program for drivers who are not able to afford your typical plan which is popular in the cities of Corona, Salinas, and Escondido. There is certain criteria to be excepted into the program. If you cannot find a policy which fits within your budget then you may want to look into the available program, if you qualify. Outlined in the table below are the best carriers by rate change, written premiums, and consumer rating. Of course, the insurers with the most amount of written premiums will have more complaints. The more customers the more complaints any business is going to have. The number of complaints is usually based on poor claims performance by a customer. The numbers in the table shouldn’t be alarming. However, you can use online customer reviews to help you make choices. I am not going into much detail about that here since you are looking for the cheapest rate at the end of the day. The rate change over an 18 month period is normal for most insurers. One thing I noticed is the amount is slightly higher for smaller more local companies. You may want to consider that when shopping. If you get a traffic violation your rate change will be significantly higher. The consumer ratings are based on JD Power & Associates, AM Best, and other reputable online sources to get an average. You can use customers past experience when you shop for a premium. However, the important factor is to understand what you are covered for and what the carrier will pay out when you file a claim if need be. The insurers listed below have good financial strength and would be able to pay out if a claim is filed. Below are 30 cities detailing the average premium. If you have a price which is significantly higher than those below you may want to inquire about it to your carrier. Look into your driving history, lapse in your premium, or possibly your credit scores. Each insurer determines your rate differently based on risk factors. Location is another factor as you can see in the table below. One of the reasons a premium is much higher in one location of the state than the other. The cost of the premium can be as low as $1,438 to as high as $2,200 per year depending on the zip code you reside in. If you would like more details based on cities please read further below. The cheapest insurance rates in Los Angeles, California are found with Progressive, Century National and Nationwide. I queried each at $1,833, $1,856, and $1,934 per year for a 30-year-old driver. Which is approximately 23% lower than the average premium in Los Angeles. If you are current or former military a good option is with USAA. For a 45-year old, the least expensive options are with Nationwide, Century National, and Progressive. I queried each at $1,432, $1,533, and $1,634 respectfully per year for full coverage. Which is approximately 36% lower than the average premium of $1,850 per year for a 45-year-old driver. Carriers I queried for quotes do not include discounts. Any insurers, including Allstate and Travelers, could be low-cost options if you include multi-policy options or other discounts for more savings. Los Angeles is home to producing 1/3 of the world’s oil in 1923. The “city of angels” has hosted the Summer Olympic Games twice, in 1932 and 1984; plus is a contender for the 2024 Games. In San Jose, the best companies to lower your insurance rates are Century National, Nationwide, and Progressive. I queried each at $1,332, $1,339, and $1,434 per year for a 30-year-old driver. Which is 31% lower than the median rate for similar age drivers in San Jose. For a 45-year old, the best options are with Century National, Nationwide, and Progressive. I queried each at $1,008, $1,032, and $1,044 respectfully per year for full coverage. All three carriers are nearly 34% lower than the median quote for similar profile drivers. Other insurers to put on your list of quotes are State Farm and Allstate. Both carriers are more expensive, however, with discounts or multi-policy options, it may be cost-effective to get a policy with them. San Jose is the third largest city in California. The average monthly rent is $1,850, but is considered one of the “least stressed” cities in the state. Home to many nature lovers who engage in hiking and camping, the city enjoys over 300 days of sunshine per year. In San Diego, California the cheapest car insurance can be found with Nationwide, Century National, and Progressive. I queried each at $1,272, $1,313, and $1,378 per year for a 30-year-old driver. Which is 39% lower than the average premium for similar age drivers in San Diego. Current or former military would do well with USAA. Other carriers to put on your list of quotes are Allstate and Travelers. Both carriers can offer 15% in savings over the average premium cost. For a 45-year-old driver, inexpensive quotes can be found with Century National, Progressive, and Nationwide. I queried each at $895, $934, and $987 respectfully per year for full coverage. Which is nearly 40% lower than the average premium for similar age drivers in San Diego. Affordable car insurance quotes in San Francisco begin with Century National, Progressive,and Nationwide. I queried each at $1,534, $1,588, $1,652 respectfully per year for a 30-year-old driver. Which is 22% to 29% lower than the median rate in San Francisco. Two other carriers you should put on your list of quotes are Grange and Allstate. Each carrier is nearly as competitive as their cheaper counterparts. Both insurers offers quotes over 19% lower than the average rate. For a 45-year old, the least expensive options are with Century National, Progressive, and Nationwide. I queried each at $1,212, $1,244, and $1,245 respectfully for full coverage. With all three carriers you can find quotes 23% lower than the median rate for similar age drivers in San Francisco. San Francisco is the most expensive city to live in California. The city is also the headquarters of Levi Strauss & Co., Gap Inc., Williams Sonoma, Twitter, Uber and Craigslist. The cheapest auto insurance in Fresno, California is with Progressive, Century National, and Nationwide. I queried each at $1,411, $1,432, and $1,455 per year for a 30-year-old driver. All three insurers are over 30% lower than the average premium for similar age drivers. Other carrier options in Fresno are with State Farm, Grange, and GEICO. All three carriers offer quotes 16% below the median rate. For a 45-year old, the cheapest premium options are with Progressive, Century National, and Nationwide. I queried each at $1,003, $1,009, and $1,113 per year for full coverage. Which is 26% to 29% lower than the median rate for similar age drivers in Fresno. Fresno is located halfway between San Francisco and Los Angeles. One of the most popular attractions is the Tower District which is included on the National List of Historic Places. Long Beach’s cheapest auto insurance companies are Nationwide, Progressive, and Century National. I queried each at $1,487, $1,560, $1,600 per year for a 30-year-old driver. Which is 22% to 26% lower than the median quote for similar profile drivers. Other carriers to put on your list of quotes are State Farm and Grange Association. Both insurers can offer quotes from 14% to 18% below the average premium for drivers in Long Beach with a decent driving history. For a 45-year old, the least costly insurers are with Nationwide, Progressive, and Century National. I queried each at $1,119, $1,156, and $1,238 respectfully per year for full coverage. Which is 21% to 26% lower than the median rate for similar age drivers in Long Beach. Long Beach, California is the second largest city in the Los Angeles’ metro area. Unknown to most, the city of Long Beach has an underground pedestrian tunnel (Jergins Tunnel) which was in use from the 1920’s to 1960’s. Drivers in Sacramento, California can find cheap car insurance with Nationwide, Progressive, and Century National. I queried each at $1,345, $1,355, and $1,421 respectfully for a 30-year old. Which is approximately 30% lower than the citywide average premium. The “mean” quote is over $2,000 per year making any of the insurers illustrated worth getting quotes from. A 45-year old can find inexpensive quotes with Nationwide and Progressive. I queried each at $896 and $925 respectfully for full coverage. Which is 32% lower than the average policy holder in Sacramento. Sacramento is one of the fastest growing big cities in the state. Incorporated as city in 1850 with a few thousand residents. Today, there are nearly 500,000 in the city with nearly 2.5 million in the surrounding area. Drivers in Anaheim can get low-cost car insurance with GEICO, Nationwide, and Century National. I queried each at $1,455, $1,489, and $1,554 per year for a 30-year-old driver. Which is 28% to 32% lower than the average premium in Anaheim. Quotes clustered between $1,455 and $1,645 so all carriers illustrated are 16% lower than the “mean” rate. For a 45-year old the least expensive quotes can found with GEICO, Nationwide, and Century National. Each queried at $1,043, $1,065, and $1,100. All three insurers are 25% lower than the average policyholders premium price. State Farm and Grange are worthy contenders since they are 18% lower than the median quote in Anaheim. Anaheim was founded by 50 German families in 1857 then incorporated as city in 1876. At the time there were less than 1,000 residents. Today, there is nearly 340,000 people which call Anaheim home. Residents of Santa Ana, California can get cheaper car insurance options by getting quotes from GEICO, Nationwide, and State Farm. I queried each at $1,321, $1,400, and $1,456 per year for a 30-year-old driver. Which is 26% to 29% lower than the average premium in Santa Ana. Century National and Grange are below the “mean” quote with prices at $1,506 and $1,575 respectfully. A 45-year old can get the best prices with GEICO and Nationwide. Each queried at $940 and $980 respectfully for full coverage. Which is 30% to 32% lower than the median rate citywide. One of the most densely populated areas in California is Santa Ana with 330,000 residents. Santa Ana was founded by a Kentuckian in 1869, then incorporated as a city in 1886. Drivers in Stockton can get the cheapest car insurance if they start with Century National, Nationwide, and Grange. I queried each at $1,344, $1,378, $1,450 per year for a 30-year-old driver. Which is 29% to 33% lower than the median rate in Stockton. In fact, all carriers illustrated are more than 17% lower than the average premium. A 45-year old can get the lowest quotes with Century National, Nationwide, and Grange. I queried each at $912, $925, and $990 per year for full coverage. Which is 29% to 32% lower than the average premium for a driver of similar age and profile. Stockton is the first community to be named without Spanish or Native American heritage. Stockton began to see an influx of residents during the California Gold Rush around 1848. Drivers in Irvine can enjoy low quotes which are lower than drivers which reside in Los Angeles. However, to get the lowest start with Nationwide, Century National, and Allied. I queried each at $1,400, $1,450, and $1,504 per year for a 30-year-old driver. Which is 23% to 27% lower than the median rate in Irvine. Grange and GEICO are 18% to 21% lower with quotes at $1,543 and $1,598 respectfully. A 45-year old can get inexpensive quotes with Nationwide and Century National. Each queried at $955 and $987 which is 26% to 29% lower than the median premium. Irvine, California was once settle by Gabrielino Indians about 8,000 years ago. During the 1800’s the land was purchased by James Irvine. Developing of the city didn’t start until the 1960’s and by 1971 Irvine was incorporated as a city.